At all ASA / CGA races Club Members participate in Club colours with your Licence numbers worn on both front and back of vest. Sunday Run Seconding: You are required to second at, at least, one Sunday run per year. Contact our Club Captains. Route (unless you want to plot your own), cups, coke, water bottle and table provided by the club. Race Duty: Our club host an annual 21/10/5km race during August. 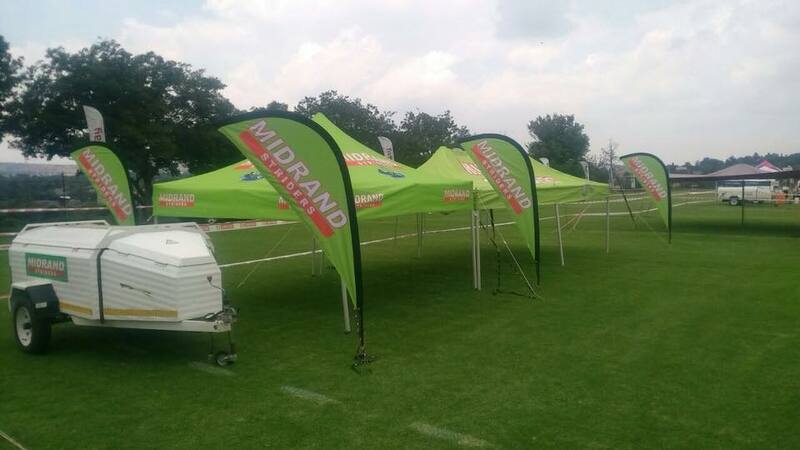 Club Gazebo at an official Central Gauteng Athletics (CGA) approved race. On an average of one (1) race a month the club committee has the gazebo / umbrellas, drinks and snacks at the finish venue of a race as per our club calendar. Please come to the gazebo before and after your race and meet all the other club members who are participating in the events of the day. Social Evenings: We have a number of social evenings, which are subsidised by the Club. Comrades Training: 60km Long Run, 23 April 2017. Our club hosts a 60km long run annually so we need seconders for the route.